Are you as excited as I am about the warmer weather and upcoming summer months?! We hope each of you are planning trips as well as staycation opportunities in the months to come. I have three small children (Gatlyn (7), Georgia Lee (4), & Guy David (4 mo)) and we love to make the most of the lazy days of summer, which generally are anything but lazy. On the cover of this edition are a few cool treats for you to let the kids experiment with now that warmer months are ahead. Don’t forget to look just a few miles down the road when considering a weekend getaway. Check out the Travel Guide in this edition to learn more. Do you WANT A SUBSCRIPTION? 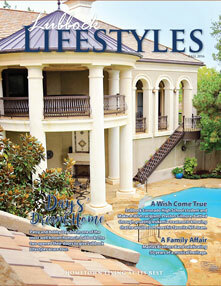 Send an email to subscriptions@hometownliving. com and put LBK in the subject line to be added to our digital subscription list which will alert you to view magazines online at www.hometown-living.com. We want to thank our advertisers. Let them know you saw their ad in this issue! I love this time of year. Watching my small children enjoy these traditions makes this time so special. In the upcoming months take a moment to reflect and slow down. Yes, it takes effort to slow down - especially with the impending holiday rush, but how else can you treasure the memories being made if you are too busy to enjoy them? Let’s try and be intentional, put our phones away, and gather together…be present! For fresh common sense tips on holiday travel read “To Grandmother’s House We Go” inside the Travel Guide this issue. Spring has sprung! 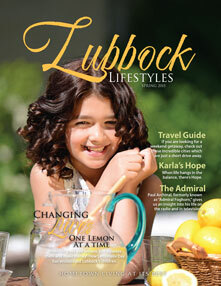 Please enjoy the beautiful pictures shared from Lubbock Memorial Arboretum (on the cover). They are living up to their mantra of, “A living tribute to everything that is beautiful!” With wedding season in mind we invite you to share your engagement, wedding, or milestone anniversary with us for consideration in future issues! Do you WANT A SUBSCRIPTION? 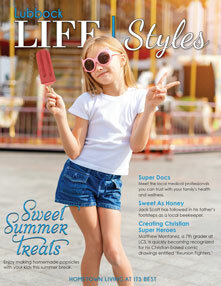 Send an email to subscriptions@hometownliving. com and put Lubbock in the subject line to be added to our digital subscription list which will alert you to view magazines online at www. hometown-living.com. We want to thank our advertisers. Let them know you saw their ad in this issue! There is no better way to show HOMETOWN LIVING AT ITS BEST than to spend your hard earned money here in your hometown. Check out the Index of Advertisers list (located at the back of the magazine) and start shopping! This issue is chock-full of great people in our community using their gifts for good in a variety of ways. We are each given different talents, but what good are they if we keep them to ourselves? Let your light shine by using those talents as you are called to do! Josh & Zephare Ramirez, Jackie White, and their team continue to pour their energy into giving to others through the Lubbock Dream Center. Russell Donaway (current President) and Bernie Gradel (past President) have dedicated themselves to the thriving Lubbock Lions Club, an organization that in 88 years has done an immeasurable amount of good in the city. What are your gifts? How can you put them to use today? A small act can make a big difference in someone’s life. We encourage you to shop local this season and start with the contributors to this publication (see a full list of advertisers on page 135). Please tell them you saw their ad in Lubbock Lifestyles Magazine and thank them for this free publication detailing a few of the many people, places, and things that make Lubbock such a great place to call home! I love fall and I love all things vintage. This season take a moment to reflect and slow down. Yes, it takes effort to slow down - especially with the impending holiday season, but how else can you treasure the memories being made if you are not intentionally present for them? Think back 50 plus years (to the days on our cover this issue) and enjoy the amazing change of seasons before us. We love to hear from you! Tell us what you love and what you would like to see more of in future issues. As always we want to feature your events and uplifting stories about the great things and people around Lubbock. All of us at Lubbock Lifestyles Magazine want to say congratulations to all of the graduates this spring! From kindergarten to college – these milestones should be celebrated. We are excited about fall…to me it means more than football and a drop in temperatures….it means memories with my babies and holiday traditions ahead! Below are a few pictures of falls past with my two children, Gatlyn and Georgia Lee, as well as, Casey’s precious 3 year old Jorie Cait. Time never seems to go by so quickly as it does when you look how much a child grows and changes in a few short months. We want to see your families’ pictures too. This season don’t forget to shop local as we all strive to support one another, our neighbors – what better way to showcase HOMETOWN LIVING AT ITS BEST than to support local shops, vendors, and to let them know you’re spending your hard earned money at home. 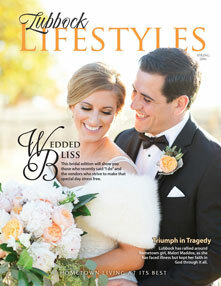 As always, we thank you for reading Lubbock Lifestyles. We strive to show you the many people, places, and things that highlight the numerous positive attributes Lubbock has to offer! Happy Fall Y’all! There is so much the Lord is doing in our neighborhoods and we are grateful to be able to share their testimonies. Our town has rallied around local college student, Malori Maddox, read her amazing testimony in Triumph in Tragedy. For the young mothers out there a must read is Holistic Mothering featuring the local group who call themselves ‘Lubbock Crunchy Moms.’ Being a mom is the most important job in the world and often times the toughest – but having a support system can make it a lot easier! Do you WANT A SUBSCRIPTION? Send an email to subscriptions@ hometown-living.com and put LUBBOCK in the subject line to be added to our digital subscription list which will alert you to view magazines online at www. hometown-living.com. We want to thank our advertisers. Let them know you saw their ad in this issue! There is no better way to show HOMETOWN LIVING AT ITS BEST than to spend your hard earned money here in your hometown. Check out the Index of Advertisers list (located at the back of the magazine) and start shopping! LIKE us on Facebook. I love fall! And all the joys and traditions this season brings. 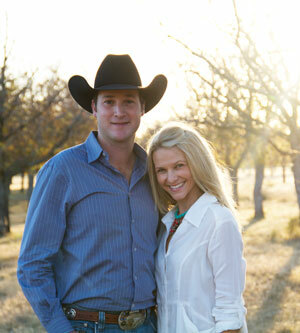 Lubbock has a long tradition of being a hub to many surrounding West Texas communities. 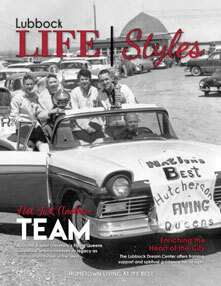 Hometown pride is something that never grows old – which is what Lubbock Lifestyles is all about! This holiday season take a break from online and instead step inside the many local shops that decorate the streets of Lubbock and let them know you saw their ad in the Lubbock Lifestyles magazine! They are promoting all that is right in small town living today through their support of Lubbock Lifestyles which is coming to you free of charge. We want your FEEDBACK. 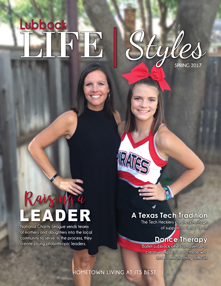 Make Lubbock Lifestyles your own – submit article ideas, your organization’s events and more with us (crystal@hometown-living. com). So if you are new to town, all you have to do is take a look to see just a few of the many events you too can take part in. There is an organization and place that fits your interests and talents. Get involved and make Lubbock your own! Find a church, meet your neighbors, and get involved! Take pride in your hometown and look for the good around you. We want to thank Lubbock for the warm welcome we have received here. 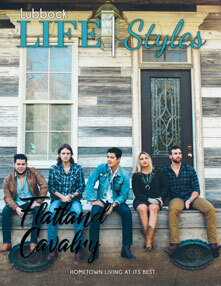 Our Lubbock roots run deep and we are so excited to bring this second issue of Lubbock Lifestyles to you. Inside this edition, feature stories range from upcoming local events, like Lemonade Day, to in depth profiles of local characters such as, Paul Archinal, in ‘The Admiral.’ Read us from cover to cover to make sure you don’t miss a thing! This is YOUR hometown magazine; leave your mark by sharing local events (Hometown Happenings), new baby photos (Hometown Bundles of Joy), high school graduation photos (Hometown Graduates), and more with us. Email Content Coordinator, Crystal, for submission details or questions. Wedding Season is HERE! Please see our ad for information on submitting your wedding announcements (call for pricing and deadline – there is a discount for early submission so don’t be late!). Send your wedding announcement questions and submissions to Matt (email below). WYIM is growing and LLM continues to be on the SEARCH for LOCAL sales people, as well as, writers and photographers (beginners and seasoned). Call our office or email Matt to learn how you can get involved in future publications! 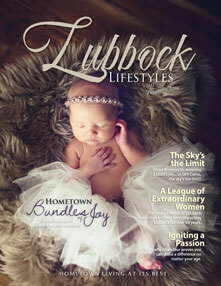 Do you WANT A SUBSCRIPTION to Lubbock Lifestyles Magazine? Email our Office Manager, Kati, and let her know you want on the LUBBOCK digital subscription list which will email you a digital copy of the latest issue. ‘LIKE’ us on Facebook at: With You In Mind Publications for additional updates on all our Texas and Oklahoma magazines. We want to thank our advertisers as always for their participation which keeps LLM coming to you FREE of charge! There is no better way to show HOMETOWN LIVING AT ITS BEST, than to spend your hard earned money here in your hometown. Check out the Index of Advertisers list (located at the back of the magazine)! Our family has been in the publishing business over 30 years and we are very excited to bring a magazine that personifies ‘HOMETOWN LIVING AT ITS BEST’ to you here. 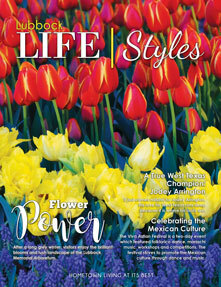 Lubbock Lifestyles Magazine is a semi-annual publication dedicated to the people, places, and things that make Lubbock such a wonderful place to live. Check out the LOCAL SHOPS advertising within these pages and get a head start on your Christmas list! There is no better way to show HOMETOWN LIVING AT ITS BEST, than to spend your hard earned money here at home. Check out the Index of Advertisers (found in the back of the magazine)! 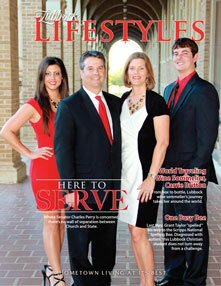 Each issue of Lubbock Lifestyles is complimentary to the public thanks to these participants! There is so much to love about the friendliness and generosity of West Texans and the profiles within these pages are just a few of the many fascinating stories we will be featuring in LLM. We want to hear your ideas too. The Hometown Happenings section is a collage of photos of local residents mingling at area social events and fundraisers. You will see familiar faces, maybe even your own – please feel free to submit your organization’s’ events to us to be considered for publication. We also welcome newborn pictures for our Hometown Bundles of Joy section. Have your photographer submit one image of your baby today. Please email our Content Coordinator, Crystal, for all submissions. Please see our ad for information on submitting your wedding announcements for the SPRING edition (call for pricing and deadline – there is a discount for early submission so don’t be late!). 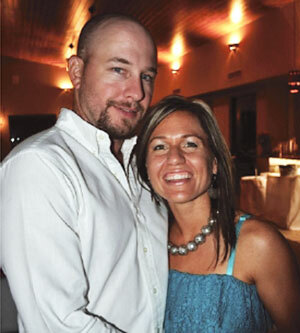 Send your wedding announcement questions and submissions to Matt. LLM is on the SEARCH for LOCAL sales people, as well as, writers and photographers (beginners and seasoned). Call our office or email Matt to learn how you can get involved in future publications! Whether you are new to town or never left, we hope you are able to learn something you did not already know about this great community. View our magazines online at www.hometown-living.com & ‘LIKE’ us on Facebook at: With You In Mind Publications for additional updates on Lubbock Lifestyles and all our Texas and Oklahoma magazines. All of us at With You In Mind Publications continue to look forward to a long relationship with this area and many more issues of Lubbock Lifestyles to come!